With the transfer of state inmates from jails, the Mack Alford Correctional Center in Stringtown is now 131 percent, or 156 inmates, over capacity. 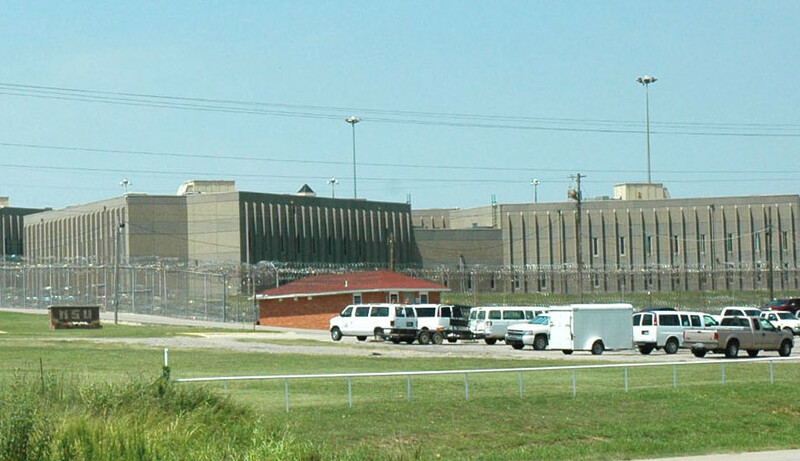 The Oklahoma Department of Corrections’ effort to shift thousands of state prisoners out of county jails has resulted in nearly two-thirds of state prisons being over capacity. The Corrections Department is placing many inmates in designated “temporary” beds in various common areas of prisons, such as a gymnasium or day room. In a related move, the agency is proposing to revise how it determines the maximum capacity of its prisons, by using a higher “operational” capacity that includes temporary beds, on top of the current “rated design capacity” — the number of inmates a facility is designed to hold. Under operational capacity, the current reported percentages of occupancy at many prisons could drop from over to under 100 percent. The recent inmate population growth is raising concerns from the head of the state correctional officers’ group, who says safety is being compromised because inmates are being added while correctional staffing levels remain inadequate. According to the corrections department’s Aug. 4 count of inmates, 16 of the state’s 24 minimum-, medium- and maximum-security prisons and prison units were at more than 100 percent capacity. The number slipped to 15 the following week. Five facilities had more than 100 inmates above their official capacity limits. The overall inmate population in state prisons is at 105 percent of capacity, the data shows. That doesn’t include lower security-level Community Corrections facilities, which were slightly below full capacity on Aug. 11. With Community Corrections factored in, the system is at 104 percent capacity overall, the highest since at least 2007. Several individual prisons have especially high numbers. The medium-security Mack Alford Correctional Center in Stringtown was at 131 percent of listed capacity, or 156 inmates over capacity. The medium-security James Crabtree Correctional Center in Helena was at 119 percent capacity, or 153 inmates over. The total inmate count in state prisons has climbed by nearly 8 percent over the past year, to 16,668 inmates. Jerry Massie, department spokesman, said the increase is a result of the agency’s efforts to reduce the number of prisoners housed in county jails, which will save the department millions of dollars in per-diem payments to counties. He said safety is always a concern when placing inmates, and that available space for temporary beds and staffing levels are taken into consideration. So far, no serious incidents have occurred as a result of the moves, he said. When Corrections Director Robert Patton was hired in February, one of his first initiatives was to reduce the number of inmates sentenced to prison but being kept in county jails. The department has faced serious budget woes and saw an opportunity to cut millions of dollars in costs. Also, some counties had complained about having too many state inmates in their jails. Tulsa County sued the state over the issue, although it dropped the lawsuit in June after the state transferred out many inmates. Other counties wanted to keep their state inmates because they said they needed the per-diem revenue and protested when inmates were removed. The department initially estimated that about 2,000 state inmates were in jail backup but later discovered that the number was around 3,500, Patton wrote in a July 15 letter to State Auditor and Inspector Gary Jones. The letter was in response to a performance audit of the corrections department conducted by Jones’ office at the order of Gov. Mary Fallin. According to the latest weekly count sheet, only 175 state inmates are now being held at jails in 42 counties. The department reduced the backlog by speeding up the processing of arriving inmates and restoring some inmates’ credits toward parole that had been lost because of misconduct, Laura Pitman, deputy director of institutions, told the Board of Corrections in April, according to meeting minutes. To accommodate more inmates, the department planned to add 270 temporary beds at minimum-security facilities and 400 temporary beds at medium-security facilities, Pitman said. Those moves began occurring later that month, the weekly-count reports show. The department also planned to make room by moving some inmates from minimum-security facilities to lower-security Community Corrections facilities and work centers. It also planned to move some inmates from Community Corrections facilities and work centers to halfway houses, Pitman said. Among the recommendations of the audit, which was released in late July, was that the department revise how the prison system’s total capacity is determined so that inmates housed in county jails are included. Capacity must be approved by the Board of Corrections and is based on building design, sanitation facilities, space requirements and correctional needs for each facility or its special units. Adding temporary beds must be approved by the state fire marshal and meet space and staffing requirements set by the corrections board. In his July 15 letter, Patton said the department was already reviewing how it defines capacity. He said it was considering a new formula that counts temporary beds, which are beds that go beyond the maximum number of inmates the facility was designed to hold. The “rated design capacity” plus the temporary beds would equal a facility’s “operational capacity,” Patton wrote. The new measure would give the department a better idea of overcrowding and true capacity. With the new formula, the department would be able to “accurately determine how many offenders are incarcerated, what percent of overcrowding is in place, facilitate utilization of statutes relevant to overcrowding and, more importantly, start accurately projecting future growth,” Patton wrote. One question is whether adding a new capacity measure would affect the potential for inmate percentages to trigger a state-law requirement that the Pardon and Parole Board consider paroling some non-violent inmates to relieve overcrowding. The auditor’s report recommended that the corrections department start counting inmates in jail backup and other programs in calculating percentage fill of capacity. That could cause the parole to consider releasing non-violent offenders with six months or less left on their sentences, the audit said. However, Massie, corrections department spokesman, said his department’s interpretation of the law is that all facilities must be at full capacity for the parole board to take action. He said the department is doing a study on capacity, and the impact on capacity limits won’t be known until the study is complete. Meanwhile, Lynn Powell, director of the prison reform group OK-CURE, said she has gotten reports of shortages of some types of food in state prisons because of the growing number of inmates, resulting in smaller portions. She also expressed concern about safety for officers, staff and inmates and about effects of the increased demand on prison infrastructure, such as water systems and sewage lines. Massie said the facilities that have placed offenders in temporary beds have not experienced any infrastructure problems as a result. He said there have been no shortages or smaller portions of meals in those prisons.